Fred Roumbanis started the final day of competition in the Bass Pro Shops PAA Tournament Series tournament on Alabama's Neely Henry Lake in a bit of a funk. After finishing the second day of the tournament in sixth place with a two-day total weight of 25.76 pounds, the Bixby, Oklahoma pro was less than two pounds off the pace set by Greg Hackney, but felt as though he'd let a golden opportunity slip through his fingers after failing to boat three key bites that would have increased his total weight by over four pounds. Friday's lost fish were a distant memory by the conclusion of Saturday afternoon's final weigh-in, which was held at Bass Pro Shops in Leeds, Alabama. With a limit weighing 12.95 pounds, Roumbanis edged out Mississippi's Paul Elias by a mere .24 pounds to hoist the PAA Tournament Series trophy with a final weight of 38.71 pounds. Along with the trophy and the title, Roumbanis collected a Nitro Z8 boat, equipped with a Mercury 225 OptiMax engine with a retail value of over $40,000. He also earned $1,250 in cash and picked up an additional $300 for the Big Bass of the day, a 4.41 pound largemouth. "I had several opportunities to catch some really big bass over the last three days, and I just kept fumbling and losing them," said Roumbanis. "When that happens, you're not supposed to win the tournament. Even after I weighed-in today, I didn't think there was any chance that I'd come out on top. If you fish enough tournaments and you fish hard, you're going to win a few. When it's your turn to win, it happens. This just happened to be one of those tournaments." Roumbanis primarily targeted shallow water banks with patches of water-willow. He credited fellow Oklahoma pro, Gerald Brown, with keying him in on the pattern. "We were sharing information, and he was catching some quality fish flipping," explained Roumbanis. "During practice, I covered a lot of water with a frog and didn't get that many bites. When I slowed down and flipped the grass, I started to see results." On Thursday and Friday, he caught all of his bass flipping a Reaction Innovations Sweet Beaver in either Watermelon/Red or Sprayed Grass color. Roumbanis rigged the soft plastic on a 4/0 Gamakatsu Heavy Cover Worm Hook and alternated between four different sizes of Picasso tungsten weights. "I have a lot of experience fishing that type of grass, and there are certain ways that you can snap your bait and make it glide," he explained. "A light tungsten weight was critical in getting the right action and generating a strike." Roumbanis used his signature series 7'5" iRod, called "Fred's Magic Stick," and spooled his 7.2:1 Ardent Edge Elite reel with 20-pound-test P-Line fluorocarbon line. When thunderstorms passed through the Gadsden, Alabama area on Friday afternoon, Roumbanis made a slight change in his game plan for Saturday's final round. "Just from my past experiences, I knew that if it stayed cool this morning, I was going to get bit throwing a frog," he explained. "When I got to my first spot this morning, it just looked like great frog water." Roumbanis dug a frog rod out of his rod locker, and was rewarded with a three pounder on his first cast. Several yards down the bank, he caught a largemouth over four pounds that succumbed to the frog. "I'd never even throw the frog on the first two days," explained Roumbanis, who used a black Snag Proof Bobby's Perfect Frog that he matched with a 7'5" AIR Series iRod and 50-pound-test P-Line braid. "At that point, I had to decide if I wanted to fish the frog or go flipping. I decided to put the frog down and go back to flipping, because that was the technique that got me to the final day. That was probably the best decision that I made during the week." Flipping proved to be a winning technique for Fred Roumbanis. With the flipping stick back in his hands, Roumbanis ran to a stretch of bank where he missed a big largemouth on Thursday, and he was rewarded with a four-and-a-half pounder. "It's pretty amazing to win a tournament with the PAA," said Roumbanis. "It's a unique tournament because you have a combination of Elite Series pros, FLW Tour pros, and local heroes who really know the lake. Honestly, I had never even seen a map of this lake before this week. All of my fish came within 10 miles of where we launched." After back-to-back efforts of 13.53 pounds on Thursday and 13.43 pounds on Friday, Paul Elias weighed 11.51 pounds on Saturday to finish in second place with a total weight of 38.47. On both Thursday and Friday, Elias caught the majority of his weight during the final hour of the day, picking off spotted bass that positioned behind a rocky point on the main river when the current flow increased each afternoon at around 1:30. "I was sure that I'd be able to catch at least one good fish when the current started flowing at around 1:20 today," said a disappointed Elias. "For some reason, I just couldn't get a bite. After I stowed the trolling motor and started to head back to the ramp, a school of bass came up and started busting shad on the surface, but I had to leave because I was cutting it close. It was just a timing deal and I was on the wrong end of the clock." Elias caught the majority of his bass on a one ounce Mann's Legend spinnerbait that is no longer in production with gold and silver willow leaf blades. He also caught some fish on a magnum finesse worm and buzzbait. 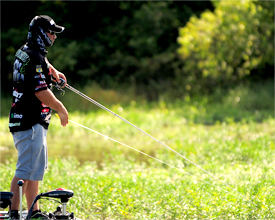 "In practice, I caught 12 to 14 pounds everyday on a buzzbait," said Elias. "I wasn't able duplicate that during the tournament. Why they got off of it, I have no idea." Third place went to Virginia's John Crews, who boosted his three day total weight to 37.93 pounds after bringing a 12.84 pound limit of Neely Henry Lake bass to the scales on Saturday afternoon. Crews mixed it up, alternating between a Missile Baits Missile Craw and a SPRO Fat John crankbait. He flipped the Missile Craw around shallow isolated wood and docks. He said that the key was working the bait slowly across the bottom. He fished the crankbait around rock in less than five feet of water. "I really never got a morning bite going all week," he explained. "I really had to grind it out during the middle of the day." 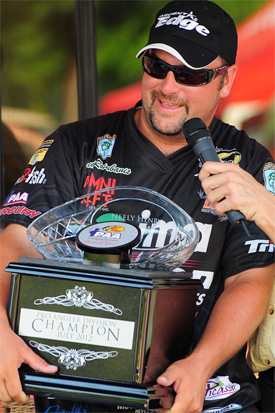 Leading the tournament heading into the final day, Greg Hackney was well aware of the fact that any of his 14 competitors had a good chance of catching him. "I really felt like even the guy who was in 15th place had a shot at winning with just a good limit of fish today," he stated. Unable to rediscover the flipping bite that had carried him throughout the first two days, Hackney struggled on Saturday, bringing in a limit that weighed just 10.38 pounds to finish in fourth place with a total weight of 37.69. Odenville, Alabama's Jason McCullars rounded out the top five with a total weight of 37.68. The overall Humminbird/Minn Kota Big Bass Award went to Alabama's Steve Kennedy, who boated a 5.61 pound largemouth on Friday. The fish earned Kennedy a Humminbird 898c si sonar unit.